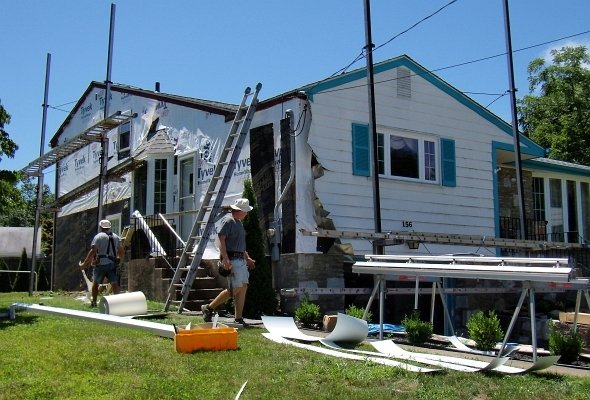 Vinyl Siding – Vinyl siding is affordable and durable. It can withstand any weather, form high temperatures to high winds. It is not susceptible to termites or rot, comes in variety of colors. Although it is moisture resistant but can trap moisture underneath it, which causes new set of problems. Vinyl is a PVC plastic, which means it can crack or fade but don’t have to. Also it should be washed at least once a year. Wood Clapboard Siding -Is organic and sustainable, and can look simple and rustic or rich and sophisticated. Wood can provide you with a wealth of architectural style options, especially since there is so many types of wood to choose from such as redwood, fir, pine, cedar, spruce, larch and cypress. Each type offers its own unique qualities and varies in price. Cedar Shake Siding – can last up to 30 years, but need a relatively low maintenance every five years to prevent rot and mildew. Is made of cedar wood, shingles can be stained with variety of earthy colors. Staining minimizes peeling as opposed to painting. Shingle siding is natural, beautiful and most well-suited to northwest and northeast wooded environments. Engineered Wood Siding – is also known as composite wood, come in inexpensive panels that are easy to install. Engineered wood is made from wood product mixed with other materials. Its stronger than real wood and also lighter. It comes ready to paint or pre-finished which helps to lower installation costs. This type of wood looks like real wood, it is cheaper, requires lower maintenance and is more resistant to all types of weather. Seamless Steel Siding – Steel siding is extremely strong, will not rust, bulge, crack or chip. It is fire and bug resistant. Also, can be custom made and come in any color which can add a little bit more price to it, but a good investment always pays off. This type of siding is extremely durable and does not need much maintenance. Steel siding comes in any color. Aluminum Siding –vinyl or aluminum siding is a low-cost, low-maintenance siding alternatives. Aluminum won’t crack like vinyl and is very durable. It is termite-proof, fire-proof and won’t rot. It can dent or require painting every once in a while but for the most part it is a great option for a low-budget siding option. Stone – Is often seen in commercial structures such as hotels and condo complexes. It is very expensive, elegant and sophisticated. It’s also one of the most durable building materials. Granite, slate, and other stones are beautiful and hardy, and can withstand weather extremes. Brick and Brick Veneer Siding – Brick is extremely durable, doesn’t rot or fade or require painting. It can last a lifetime and won’t need a repair or maintenance. It is made from fired clay and comes in variety of attractive tones. Brick is also expensive but brick veneers are also available at a lower cost. Veneers are also fireproof and durable but won’t last as long as brick itself.